The Continuously Variable Transmission (CVT) in your vehicle is electronically controlled to produce maximum power and smooth operation. This CVT is designed so that the foot brake pedal must be depressed before shifting from P (Park) to any driving position while the ignition switch is in the ON position. 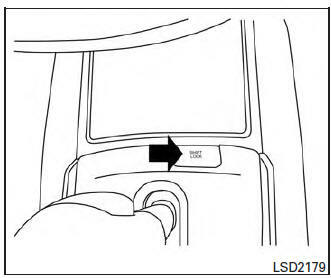 The shift lever cannot be moved out of the P (Park) position and into any of the other positions if the ignition switch is placed in the LOCK, OFF or ACC (if equipped) position. 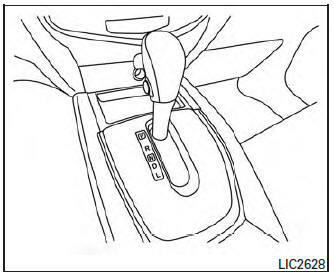 Keep the foot brake pedal depressed and move the shift lever to a driving position. Release the parking brake and foot brake pedal, and then gradually start the vehicle in motion. Do not depress the accelerator pedal while shifting from P (Park) or N (Neutral) to R (Reverse), D (Drive) or L (Low) position. Always depress the brake pedal until shifting is completed. Failure to do so could cause you to lose control and have an accident. Cold engine idle speed is high, so use caution when shifting into a forward or reverse gear before the engine has warmed up. Never shift to P (Park) or R (Reverse) while vehicle is moving. Failure to do so could cause you to lose control and have an accident. When stopping the vehicle on an uphill grade, do not hold the vehicle by depressing the accelerator pedal. The foot brake should be used for this purpose. After starting the engine, fully depress the brake pedal, push and press the shift lever button and move the shift lever from the P (Park) position to any of the desired shift positions. Use the P (Park) or R (Reverse) position only when the vehicle is completely stopped. The brake pedal must be depressed and the shift lever button pushed in to move the shift lever from N (Neutral) or any drive position to P (Park). Apply the parking brake. When parking on a hill, apply the parking brake first, then move the shift lever into the P (Park) position. Use the R (Reverse) position to back up. Make sure the vehicle is completely stopped before selecting the R (Reverse) position. 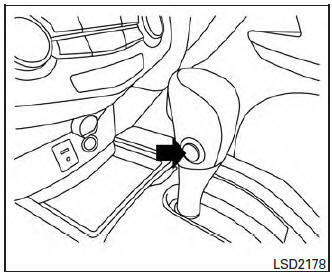 The brake pedal must be depressed and the shift lever button pushed in to move the shift lever from P (Park), N (Neutral) or any drive position to R (Reverse). Use this position for engine braking on steep downhill gradients/climbing steep slopes and whenever approaching sharp bends. Do not use the L (Low) position in any other circumstances. Place the ignition switch in the OFF or LOCK position. Press the shift lever button and move the shift lever to the N (Neutral) position while holding down the shift lock release. The vehicle may be moved to the desired location. Replace the removed shift lock release cover after the operation. If the shift lever cannot be moved out of the P (Park) position, have a NISSAN dealer check the CVT system as soon as possible. When the O/D OFF switch is pushed with the shift lever in the D (Drive) position, the light in the instrument panel illuminates. For additional information, refer to “Overdrive off indicator light” in the “Instruments and controls” section of this manual. If the vehicle is driven under extreme conditions, such as excessive wheel spinning and subsequent hard braking, the fail-safe system may be activated. The MIL may come on to indicate the fail-safe mode is activated. For additional information, refer to “Malfunction Indicator Light (MIL)” in the “Instrument and controls” section of this manual. This will occur even if all electrical circuits are functioning properly. In this case, place the ignition switch in the OFF position and wait for 10 seconds. Then push the switch back to the ON position. The vehicle should return to its normal operating condition. If it does not return to its normal operating condition, have a NISSAN dealer check the transmission and repair if necessary.